The term "magic" is etymologically derived from the Latin word magi, a term that was used to refer to Zoroastrians. Performances we would now recognize as conjuring have probably been practiced throughout history. The same level of ingenuity that was used to produce famous ancient deceptions such as the Trojan Horse would also have been used for entertainment, or at least for cheating in money games, since time immemorial. They were also used by various religions from times ancient, and were even known as far back as the early 17th century to be used to frighten uneducated populi. However, the profession of the illusionist gained strength only in the eighteenth century, and has enjoyed several popular vogues. 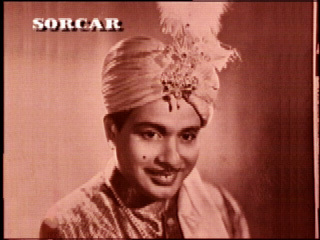 Pratul Chandra Sorcar (P C Sorcar Sr.): Pratul Chandra Sorcar (P C Sorcar Sr.) is known as the Father of Modern Indian Magic. Magic being in his blood as he profoundly asseverated. "When asleep I breathe Magic; when awake I work Magic," Sorcar said in full spirit of ease and delight. The very name of P C Sorcar conjures up the vision of outstanding feats of Indian Magic: the Rope Trick, the Flying Carpet, the X-Ray Eyes. He cast his spell over the most unbelieving audiences and showed before the naked eyes what people thought was impossible. Besides personal achievements in honours (Maths), fame and glory Sorcar's greatest contribution to the World of Magic was the installation of Indian Magic - his beloved Ind-dra-jal - to the pedestal of pristine glory with greater halo round its crown. Under his light and lead it became an Art of International attraction. Sorcar's triumphal success was a magic by itself, but not achieved in one day. It was a whole life's dedication that made him the World's Greatest Magician. He went around the globe several times performing his magic lifting a dying art of India and bringing it to limelight. His items were not mere tricks; each was a combination of modern science mixed with tastefully designed art. Micky Hades, the editor of Hade-E-Gram monthly magazine of Calgary, Canada, wrote about him in his article titled "Sorcar's Artistic Triumph": He was the founder of All India Magic Circle where thousands of members from around the world learned magic under his guidance. Born in a family of magicians of seven generations, Sorcar started off as a stage name for Protul Chandra Sorcar, a name destined to attain ranks of immortals later. A citizen of India, he was born on February 23, 1913 in the small town of Tangail in Mymensing which now lies in Bangladesh. His father's name is Bhagawan Chandra Sorcar and mother, Kusum Kamini. He had one sibling, a brother, Atul Chandra, ten years younger than him. Sorcar was a brilliant student at school. He graduated from Tangail Shibnath High School in 1929 with first class. In 1931 he earned his I.A. (Intermediate in Arts) degree from the Karotia College (first class) and then joined Ananda Mohan College for B.A. (Bachelor of Arts) with honours in Mathematics. In 1938 he married Basanti Devi, the daughter of Dr. Pramatha Nath Majumder, a renowned medical doctor of Mymensing, Bangladesh. Basanti Devi remained the main source of inspiration for all his achievements throughout Sorcar's life. From the very childhood Sorcar found magic to be the passion of his life, which he took up as a full time profession after he sat for his B.A. degree tests in 1933. His singular devotion soon brought its own honest reward. His unique feats of the newly cultivated art had soon won robust acclamation from the press and the public alike. He was hailed as one giving to the Art of Indian Magic a new cultural background which readily found a strong international appeal. Sorcar's interest in writing books on magic flourished simultaneously with his magic shows. Over his life time, he has been a regular contributor of magic-articles to numerous magazines and journals thoughout the country and was the author of over 22 books on magic, starting with "Hypnotism", which he wrote while still a college student. The success of the first book led to the other books such as "Mesmerism", "Chheleder Magic", "Magiker Kaushal", "Sahaj Magic", "Magic For You", "More Magic For You", "Hindu Magic", "100 Magic You Can Do", "Indrajal", "Deshe Deshe", "Sorcar on Magic", "History of Magic" etc. in Hindi, Bengali and English languages. Sorcar died of a heart attack at the young age of 58 in Ashaikawa, Hokkaido, Japan, on January 6, 1971, where he was performing his Ind-dra-jal. The world mourned the great king of magic. Messages of condolence came from friends, families, magicians from all over the world, and from Government authorities and leaders of many countries including Japan, U.K., Australia, New Zealand, USA, and Soviet Union. India's Prime Minister Indira Gandhi mourned the loss of the great son of India stating "...with the death of Mr. Sorcar has ended the glorious chapter of Indian magic".